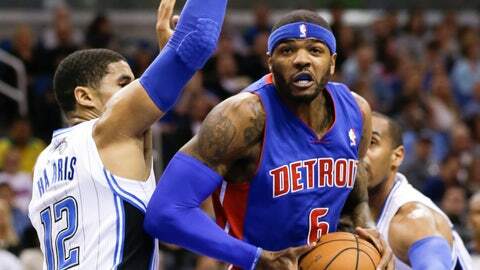 Orlando forward Tobias Harris played a crucial role in slowing down Pistons big man Josh Smith on Friday night. ORLANDO, Fla. — If you follow the Orlando Magic and you’re into numbers, this one should jump out at you: They are winless in 17 games this season when opposing teams score at least 97 points against them. So it shouldn’t have come as a surprise Friday night that their primary emphasis before taking on the Detroit Pistons was defense. Yes, it was encouraging to see Arron Afflalo score 23 points despite turning an ankle early in the third quarter and Victor Oladipo post a career high in assists after not even getting off the bench in the second half of their most recent game. But the trick is to look more like a team that held the Pistons to 66 points through three quarters rather than the one that gave up 65 points in the first half Monday night to the New York Knicks. "Tonight we focused defense first instead of offense," forward Tobias Harris said following the Magic’s convincing 109-92 thumping of the Pistons. "Going forward, that’s going to be key for us. Whether or not we’re making shots or not, (it’s) being able to realize that defense is going to help us win these games. And I believe we did that tonight." Harris was proof of that. His 16 points and 10 rebounds might not have been as impressive as the fact that he was largely responsible for Josh Smith, a Magic-killer from his years with the Atlanta Hawks, missing all but two of his 13 shots. "Overall, he’s been very committed to the defensive end of the floor," coach Jacque Vaughn said. Even Jameer Nelson, who will be the first to admit he’ll never be known as a lockdown stopper, knew he had to turn it up a notch after Brandon Jennings scored 18 of his 21 points in the first half. "He’s the head of the snake for those guys," Nelson said. "And it was up to me to buckle down and be more efficient defensively." The 18 points that the Pistons managed in the third quarter represented a season low for a Magic opponent. By the time former longtime Piston Jason Maxiell knocked down a jump shot seconds after entering the game, the Magic had rendered the final 18 minutes largely meaningless. Magic Musings: Ken Hornack breaks down how the Magic took control at home against Detroit. Recap: Arron Afflalo scored 23, and three other players finished with double-doubles as the Magic ran through the Pistons. Where was this team in the losses over the past week to the Knicks and the Sacramento Kings? "We have a tendency to lay back in the third quarter and not come out with a lot of energy," said Nelson, who played only 24 minutes in all and was the only Magic starter not to place in double figures. "But tonight, I felt like we put a big emphasis on playing in the third quarter as hard as we can and not worrying about who got the shots." Not surprisingly, many of those shots went to Afflalo. Despite the Magic’s 9-20 record, it doesn’t take much to make a compelling case for him being chosen as a reserve for the NBA All-Star Game in New Orleans come February. "I don’t think you can pick too many spots during the course of a game where’s he rushing and pressing to make shots and take shots," Vaughn said. "He’s getting in a good flow of the offense." Others shared in that flow. Oladipo had 10 points and eight assists by halftime and ended up with one turnover in 36 minutes. The switch by the Magic to have him come off the bench and be on the floor without a secondary ball-handler appears to be paying off. That was apparent to begin the second quarter, when the Magic held their own with a lineup that included Oladipo and seldom-used reserve guards Ronnie Price and Doron Lamb. "I was just being patient — just keeping my head up coming off ball screens and reading what the defense was giving me," Oladipo said. "I was playing with a great pace. Now I’ve just got to be consistent with it." Consistency has been in scarce supply for a team which last strung together back-to-back victories the week of Thanksgiving. Being able to close out 2013 with at least two wins on their six-game home stand sure would help. "It’s no mystery," Afflalo said. "We know what we need to do — the same focus, the same effort."